The International Festival of Digital Arts and New Media, Athens Video Art Festival, is celebrating for the tenth year the free expression of the arts and new technologies returning to the familiar paths of “Technopolis” City of Athens from 2 to 5 October. This year’s edition of Athens Video Art Festival aims to present eight harmoniously linked categories: video art, animation, applications, installations, performances, digital image, web art, music, by correlating the emergence of various sources of expression with the need for a re-“establishment” in art. Through a series of screenings, exhibitions, document actions, workshops, lectures and academic presentations, it combines the industrial heritage of the old gas works with the digital art and technology institution, aiming at providing cultural energy to illuminate the city and expand creativity extremities. Monday Night’s Philosophy Is Back! What a better way to spend your Monday evening than exploring the philosophical views of Socrates and Plato? Now that autumn is here the ”Socrates, Plato & Know Thyself” night is back to add an educative twist to your week! The meeting takes place at 7 pm in the Athenstyle rooftop bar and lasts about 40 minutes with questions afterwards. James explains the basics of what Socrates, Plato and Greek Philosophy was all about, and why new students at Plato’s Academy usually began by studying the book ”First Alcibiades” and the essential Greek philosophical concept of ”Know Thyself”. We strongly recommended both for our visitors as well as for everyone who wants to spent an evening at a beautiful roof with a great view of the Acropolis! Are you ready for the best student experience of your life? Doing a semester abroad is one of the best things to do while studying, but it can be a little stressful in the beginning. 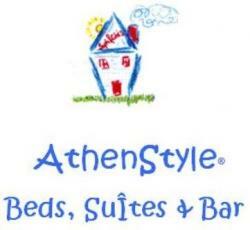 Athenstyle is here to help you and make sure you will have a great time! Book with us your first 3 days stay and we will help you to settle down, find a flat, find the coolest spots in town and meet other exchange students! We and want to make your stay in Athens fun and we would be very pleased to meet you! After your first 3 days, you can decide to stay longer at the same special price we have reserved for you by buying packages of further 3 days stays or upgrade to a LONG TERM stay. • Budget rooms located in our second building, equipped with a fridge, for 350 EUR/month for 2 people. All of the above rooms can sleep up to 4 people, so if you would like to share with more friends you can, at only 100 euro extra/month. All the rooms have private bathrooms and feature new beds, comfortable mattresses, and air conditioning/heating. Bed linen is provided for free and changed weekly. Towels are available for rent at reception (2€). Rooms are cleaned weekly for no additional charge. One of the things you should definitely do while visiting Athens, especially in September, is to watch a show in the Odeon of Herodes Atticus. With just a 15-minute walk from our hostel you can visit one of the best ancient Greek theaters, which is absolutely magical by night. The experience of watching a show there is unique and you should not be afraid of the language barrier since there are lots of ballet performances, opera plays and music concerts. The Odeon Of Herodes Atticus was built in 161 AD by the Athenian magnate Herodes Atticus in memory of his wife, Aspasia Annia Regilla.